“En Petit Comité Sessions” are a new initiative of customised presentations. In addition to the big Peclers presentations - like the one last February 28th -, I have decided to plan extra small scale sessions on Friday April 12th and Friday April 26th “en petit comité” in Amsterdam for the fall 2020/21 season. “En Petit Comité Sessions” are a new initiative of customised presentations. In addition to the big Peclers presentations - like the one last February 28th -, I have decided to plan extra small scale sessions on Friday April 12th and Friday April 26th “en petit comité” in Amsterdam for the fall 2020/21 season. We are open for registration for the Peclers presentation, February 28th in Amsterdam. If you are interested to come, you can sent an email here to register. The admission fee is € 90,-/person (ex VAT) and free for Peclers clients who have purchased books in the last two years. The location is Clifford Studio, Cliffordstraat 38, 1051 GV Amsterdam. For registration and questions you can contact us here. On Friday August 31th we will be presenting an update of the fall 19/20 season, women- & menswear. We have invited Kentroy Yearwood to give a short presentation instigating a positive mind shift towards sustainability being an opportunity, rather than a costly burden. We are happy Kentroy has agreed in sharing some of his knowledge about innovation and working sustainably from scratch in the fashion industry. Being aware of the critical issues that plague the world today, he implements a green yet commercial way of thinking into all his projects and collaborations. He inspires and motivates the industry to choose beyond "greenwashing" and opts for responsible products and progressive solutions for a healthy and far reaching future. During welcome and breaks there will be sufficient time to check the new books. All the fall 2019/20 books will be available. We also have some information about the spring 2020 season. The presentation will be held in the Cliffordstudio! The address is: Cliffordstraat 38, 1051 GV Amsterdam . Please keep in mind that public transport has recently changed in Amsterdam - we suggest to take tram 5 or bus 21, but do double check what is the best option for you. As always depending on the people coming, the presentation will be given either in Dutch or in English. We have increased the entrance fee with € 10,- and is now € 90,- (excl. VAT) per person. The admission is free for Peclers’ customers, who've purchased books in the past two years for two people. If you are not a customer and you decide to buy a book during the event, the entrance fee will be reimbursed. We hope you can make it and thanks in advance for letting us know if you’d like to attend the presentation here. In case you want to make an appointment earlier to see the new fall 2019/20 or the first spring 2020 books, do let us know in a reply mail. You're kindly invited to a Peclers' presentation on Thursday, March 22nd in Amsterdam. We will be presenting Inspirations & Colours Fall 2019/20. On Friday February 2nd we are organising a day of inspiration, to update the spring 2019 season, with men- & womenswear presentations. 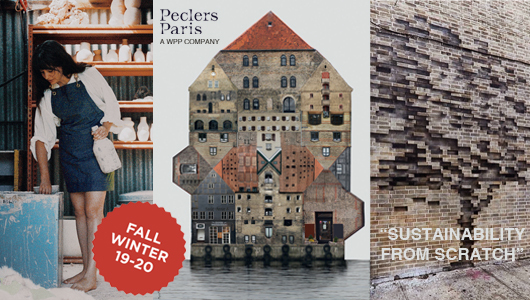 You're kindly invited to a Peclers' presentation on Thursday, November 9th in Amsterdam. We will be presenting Inspirations & Colors Spring 2019. The presentation will be held again in the Cliffordstudio! Happy to be one of the speakers during the Soul Salon in Amsterdam July 9 & 10th. You can check the program here.